The Illinois Program for Research in the Humanities (IPRH) at the University of Illinois at Urbana-Champaign has awarded its annual Faculty and Graduate Student Fellowships to seven faculty members and seven graduates students from the campus for the 2019–20 academic year. Please join us at REEEC in congratulating Helen and Diana on this outstanding achievement. Please see their project titles below. For more information, please see the IPRH Newsletter. Gabrielle Cornish’s lecture “Sounds Like Lenin: Noise and the Problems of Socialist Modernity” was an interesting study of the importance of sound in the history of the post-Stalinist Thaw. Cornish considers the aural ramifications of late-socialist urbanization and industrialization. While Soviet citizens visually interpreted the construction of large and dense cityscapes as a sign of Soviet progress, and enjoyed gaining access to valued consumer goods such as automobiles, televisions, and radios, they were confronted by a distressing loudness that seeped into their everyday lives. In addition to the availability of new products and technologies, Soviet citizens were faced with the aural realities of the modern city’s high population density. While, urban dwellers were able to transition from communal apartments—in which families shared much of their living spaces with each other—to separate single-family apartments, the high number of families in these apartment buildings, coupled with their thin concrete walls, resulted in a complete lack of sonic privacy despite being visually separated from their neighbors. Also, noisy neighbors could dominate such spaces through playing loud music or television programs, talking loudly, hosting loud parties, etc. As a result, these sonic hooligans could then inadvertently lower the quality of life for their fellow citizens. Cornish indicates that the Thaw Generation had to adjust to the new sonic realities of socialist modernity, and that noise became an issue of public health. Moreover, by controlling noise for the betterment of its citizens, the Soviet government could argue that only a socialist state could intervene, while the capitalist alternative was too weak or ambivalent to protect its citizenry. Cornish’s investigation follows two lines of inquiry from this point: how concepts of urban noise influence the subject matter of film and music, and how did it shape the discourse surrounding modernity and public health. In the former, cautionary tales on noise’s potential to drive well-adjusted workers to manslaughter manifested in film, and expressions of annoyance towards noisy neighbors became the subject matter of Estrada songs. And, in the latter, Soviet critics denounced the ambivalence of loud citizens, and promoted the cultivation of a new sonic civility. These critics both pressed the state to intensify its efforts to police noise violations, and to call for greater responsibility for citizens to limit their own noise-making. These latter efforts were sometimes discussed as a form of kul’turnost’ (i.e. cultured-ness), which stipulated that cultured individuals knew how to socialize, listen to recordings, perform music as amateurs, and watch television with tasteful restraint and without disturbing the mental well-being of their neighbors. It should be noted that such an interpretation implied that loud citizens were uncultured, lacked restraint, and were too immature to enjoy the gifts of socialist modernity in good taste. Moreover, Lenin himself was referenced to be the exemplar of polite silence, and these commentators reminisced that the first leader of the USSR would only tip-toe into a room and whisper so not to disturb any of his comrades. In conclusion, Cornish called attention to the fact that the focus of the majority of historians of the Soviet period in particular, and of historians in general, is on the visual and textual evidence that survives. While, such archival documentation is certainly important in order to understand the Soviet epoch, it largely ignores the sonic experience of Soviet life. In summation, Cornish proposes that visually-oriented historians are missing the nuances of late-socialist modernity by only using their eyes and not their ears. On March 7, 2019 Robert Orttung presented his preliminary findings on urban sustainability in the Russian Arctic. Orttung’s research is a part of a multidisciplinary project funded by the National Science Foundation, and includes the work of scholars from a number of fields, including political science, engineering, and anthropology. Orttung’s research focuses on possibilities for sustainable development in financially unstable Arctic cities that are impacted by climate change. The Arctic is an area that presents unique challenges, as cities of this region face extreme and quickly changing weather conditions. These cities can also be incredibly isolated, because their local economies are largely based on a single raw material (coal, oil, natural gas, etc. ), which can lead to economic destitution when that material is no longer in demand. Orttung’s presentation was in two parts: The first focused on the broader concerns outlined in the Arctic research project. Issues explored by other scholars involved in the project include the impact of “polar Islam,” or how the arrival of Muslim culture in the Arctic has impacted cities in this region, and the migration of the Arctic workforce, which has especially impacted indigenous peoples and women in these regions. In tandem with these socioeconomic factors, Orttung’s own contribution to this project is concerned with indicators of stability in urban governance. By tracking voter turnout in various Arctic cities, Orttung has indicated that high political participation is a large contributing factor to urban sustainability. The second part of this lecture focused on two Russian Arctic cities in contrasting states of development. Vorkuta, a once-prosperous city fueled by the coal-mining industry, experienced an economic boom in the 1940s and 50s when coal was in high demand. As the coal industry declined into the 1980s, the city experienced a bust period in which it relied on government subsidies for urban development. Now, the city receives no government support, and has shrunk in on itself, leaving its outskirts abandoned and its infrastructure in disrepair. Micro-entrepreneurship has become the primary survival tactic of the city’s residents. Standing in contrast to Vorkuta is the city of Salekhard—an oil and natural gas city currently experiencing an economic boom, as Vorkuta once experienced. In contrast to these urban narratives, Orttung argues that while Soviet-era urban development was quick to capitalize on economic booms in Arctic cities, little was done to plan for the inevitable decline of the boom-bust cycle of these single-product economies. As illustrated by current development projects in Salekhard, Russia has not learned its lesson from the busts experienced by urban areas in the Soviet period. What intrigued me most about Orttung’s lecture was the advantages and disadvantages presented by multidisciplinary scholarship. While Orttung pointed out that such research is not easy, and that it can be difficult to coordinate between disciplines with different expectations for completing and publishing research, it is nonetheless wise to cross disciplinary boundaries when addressing multifaceted issues. Sustainability is a complex and tightly bound knot that will require multiple perspectives and hands to untangle. I found the various approaches taken by the researchers in this project to be effective not only in identifying key factors in urban stability, but also in illustrating the multiple dimensions of urban life that are impacted by climate change in the Arctic. I look forward to hearing more about the work done for this project, and how it might contribute to increased sustainable development in Arctic cities. Melissa Bialecki is a PhD student of ethnomusicology at the University of Illinois at Urbana-Champaign. She is interested in how affective musical performance shapes political thought on the Ukrainian conflict and Russian-Ukrainian relations. Her research focuses primarily on the Ukrainian folk revival as well as ethno-punk and pop bands in Ukraine and the North American diaspora. She is a Foreign Language and Area Studies fellow through the Russian, Eastern European, and Eurasian Center at the University of Illinois, and will receive a Title VIII fellowship from Arizona State University to study Ukrainian in Kyiv this summer. Over winter break I studied Russian at the London School in Bishkek, Kyrgyzstan. The program was recommended to me by various students for its flexibility and one-on-one instruction. Like theirs, my experience at the London School was also excellent. I arrived in Bishkek right after the ASEEES conference last December and started classes the next day. The typical schedule goes something like this. Students start their day at 8:30 with an 80-minute grammar class, then a 10-minute break, then an 80-minute reading class, then a 10-minute break, then a 60-minute conversation class, then a 40-minute break, and lastly an 80-minute writing class. This schedule provides 20 hours of instruction a week (students have Wednesdays off). There is also a less intensive schedule providing 4 hours of instruction a day for a total of 16 hours per week. All of the instruction is done using online textbooks provided by London School. Students have the option of taking a placement test before starting their program, or they can — as I did — simply estimate their level and move up or down depending on how hard the material is. Each lesson corresponds to a chapter of the textbook, and there is a set of vocabulary that serves as the basis for the grammar, reading, conversation, and writing classes. I found the vocabulary to be very useful. Many times I learned some new word or phrase in class and then heard it spoken on the street a few days later or saw it used in a magazine article. 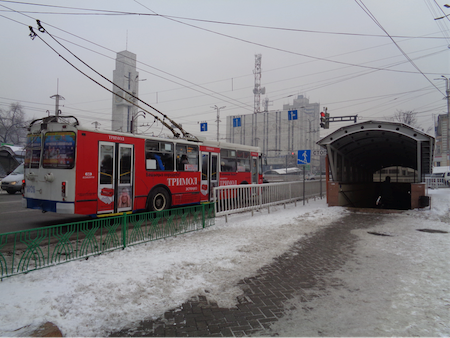 Downtown Bishkek, where Chuy Ave. intersects Yusul Abdrakhmanov St.
London School offers homestays and dormitory living. 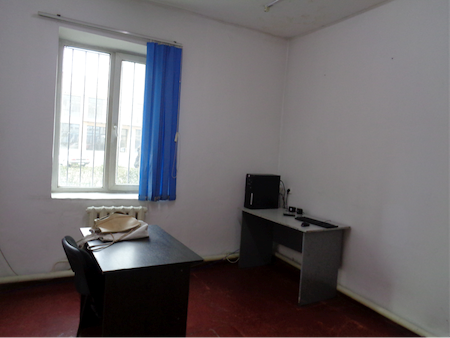 Because I was in Bishkek for such a short period of time, I stayed in the one of the dorm rooms on the second floor of the school and shared a kitchen and bathroom with a young couple who was working at the London School as English teachers. During the academic year, the London School is primarily for local students who are studying English. Summer is when foreign students tend to come to learn Russian or Kyrgyz. Over winter break, I was the only foreign student at the London School. The School of Russian and Asian Studies (SRAS) blog has a lot of entries on studying at the London School during the summer, and I would recommend anyone who’s considering London School to check out that blog. Things are livelier in the summer, there are more excursions, and it’s a great time to go hiking in Ala-Archa National Park or go to Issyk-Kul. Bishkek itself also has a lot of parks. 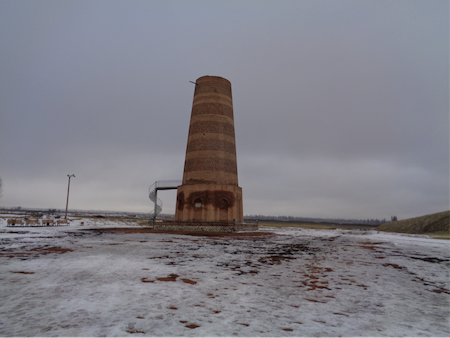 I went on a London School-organized excursion to Burana Tower. The rest of my free time was largely spent exploring Bishkek. 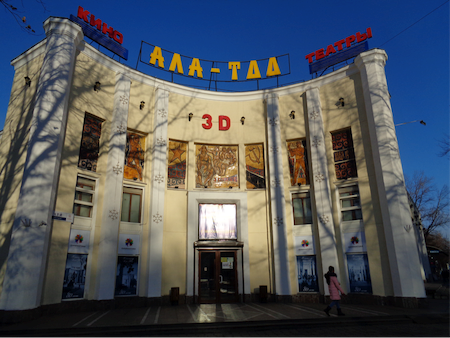 I went to the National Opera and Ballet Theater to see “The Nutcracker,” watched a Kyrgyz-Uzbek film, “Delbirim,” at the Ala-Too Cinema, and had a misadventure involving the kontrol’nyi listok at the National Library. But the place I probably went to more than anywhere else was Faiza, a restaurant that serves Central Asian and Russian dishes and that was filled every night with people dining in and getting takeout. Bishkek was extremely charming in the winter, and I expect it to be even more so in the summer. My only advice is to arrange a long enough stay so that you have the chance to explore other parts of Kyrgyzstan. 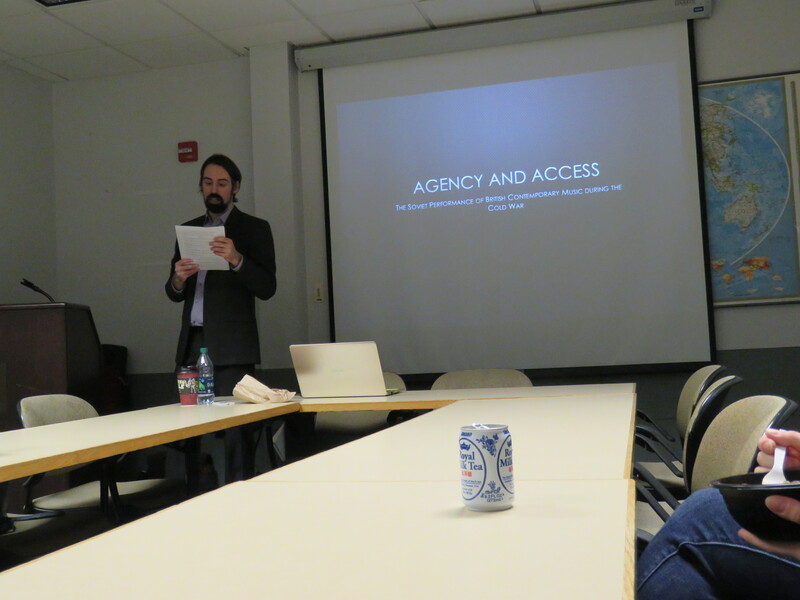 On February 12th, 2019, Thornton Miller gave a lecture entitled “Agency and Access: The Soviet Performance of British Contemporary Music during the Early Cold War.” Miller is a PhD Candidate in Musicology here at the University of Illinois at Urbana-Champaign. His dissertation research hones in on the professional agency of British and Soviet composers, concert agents, performers, and publishers in the Anglo-Soviet cultural exchange, and his noontime lecture dealt with one aspect of this research. Miller’s talk centered around the societal position of Soviet music professionals during the Cold War era, focusing on the agency granted to them through their unique societal position. These music professionals were afforded better housing and access to international travel, which then allowed them to evade many of the obstacles to cultural exchange during this era. With this agency also came access to British contemporary music, and with this access came their championing for performances of this music in the Soviet Union. Among these music professionals are Dzhemal Dalgat of the Kirov Theater in Leningrad and Gennady Rozhdestvensky and Mikhail Chulaki of the Bolshoi Theater in Moscow; these musicians stood at the center of Miller’s talk. These orchestral conductors lobbied specifically for the performances of Benjamin Britten’s orchestral compositions. Interestingly, Chulaki and Dalgat also pushed for the performances of Britten’s music in their theaters, desiring multiple performances throughout the concert season. These performances included Britten’s Peter Grimes and The Prince of the Pagodas at the Kirov Theater and A Midsummer’s Night Dream at the Bolshoi Theater. These performances are crucial, because, as Miller points out, Britten was the first living composer of a capitalist country to have their works performed in the Kirov and Bolshoi Theaters’ general repertoires. Of course, these performances didn’t come without a slew of issues to be faced. As Miller mentions, there were some topics considered to be taboo at this juncture in time; therefore, some minor details needed to be changed in order to avoid certain scandal. For this very reason, a Moscow radio studio referred to Britten’s Sinfonia da Requiem simply as Symphony in D. Likewise, Dalgat was tasked with proving the viability of Britten’s opera Peter Grimes, which came under both aesthetic and ideological scrutiny. Most interesting, perhaps, is the challenge Chulaki faced concerning criticisms of A Midsummer Night’s Dream which surfaced during the dress rehearsals. These criticisms included calling the music ‘pederasticheskaia,’ or pederastic. Miller postulates that it could potentially be read as a metaphor for western modernism, or even a reference to Britten’s homosexuality; however, it is likely meant to be a metaphor referring to musical style. Nevertheless, it is interesting to note the performances of all of these pieces ensued despite any hesitancies and criticisms, due in large part to the agency of musical professionals. Miller concluded by reinforcing the notion that the relationship between the Soviet Ministry of Culture and the music professionals must not be viewed as that of a state repressing the artists. Their relationship was, rather, that of a compromise—a compromise that granted these music professionals the agency necessary to bring these pieces to performing groups in the Soviet Union. Danielle Sekel is a graduate student in the Department of Musicology. Her research interests include Balkan music festivals in diaspora and the history and continuing relevance of these festivals. The Russian, East European, and Eurasian Center at Illinois is pleased to welcome this year’s Open Research Laboratory fellows: Dr. Emily Channell-Justice, Gabrielle Cornish, Dr. Susan Morrissey, and Dr. Maria Taylor, whose research proposals are listed below. The Open Research Laboratory fellowships provide funding for policy-relevant research on Russian, Eastern Europe, and Eurasia. ORL Fellows have access to the extensive holdings in the Slavic, East European, and Eurasian Collection at the International and Area Studies Library ORL Associates are also welcome to attend all campus programming and public talks at the Center during their stay. We are happy to introduce associates to local students and scholars, as well as to make arrangements for them to present their work in progress for discussion.